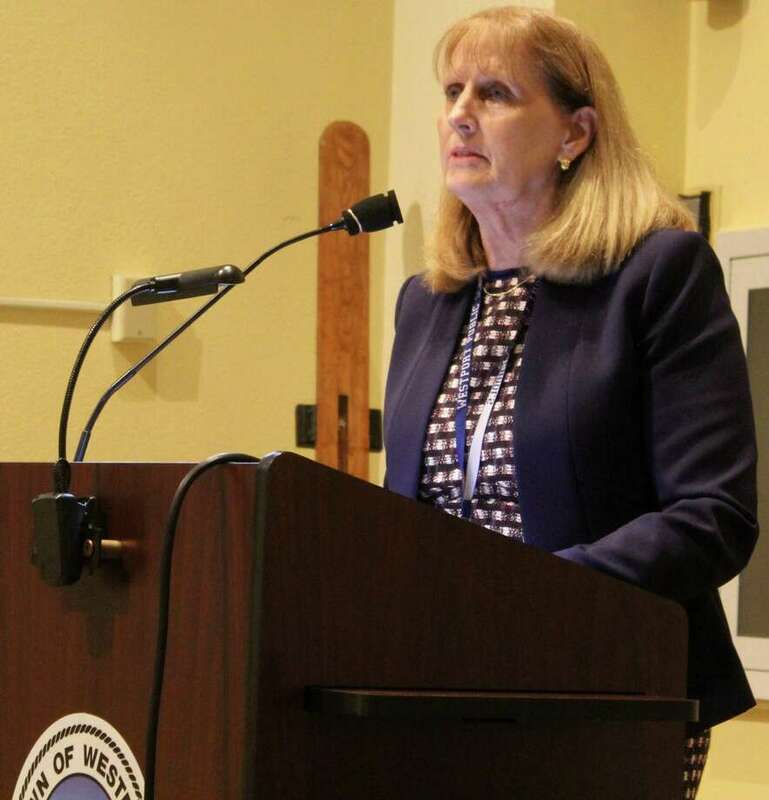 Superintendent Colleen Palmer spoke in support of an appropriation to fund two police officers to be housed in Westport's middle schools at the Oct. 2 Representative Town Meeting (RTM) meeting in Town Hall. WESTPORT — The day before Superintendent Colleen Palmer announced her resignation, the Westport Parent Teacher Association sent a letter to the education board calling for a “third-party independent investigation” into the workplace culture of town schools. The letter, which the Westport News acquired through a Freedom of Information request, was sent to the Board of Education via email and refers to a survey completed by members of the Westport Intermediate Administrators Association union that showed widespread discontent, distrust and concern among school administrators. “As direct representatives of our district’s parents and teachers, the PTA is greatly concerned about the results of the WIAA survey. We urge the Board of Education to convene a third party independent investigation to examine and evaluate the WIAA’s concerns,” read the letter, which was sent on March 13 and signed by all 18 PTA presidents from across town schools. The following morning around 10 a.m., Palmer sent an email to Westport families announcing her retirement, effective Aug. 1. The WIAA first sent the survey results to the board on March 8, and Mathias said the two groups have not yet met due to scheduling difficulties. However, he he expects a meeting between the WIAA and education board will occur soon. PTA Council Co-President Carolyn Caney said she received a copy of the WIAA survey and brought it to the PTA presidents on March 13 to discuss at their meeting. “There were concerns expressed about the superintendent’s leadership style,” Caney said. After the announcement of Palmer’s retirement, Caney said some PTA presidents still want the investigation to occur, while others are satisfied with superintendent’s resignation. “The PTA, we support our students, our families and our administrators, so we really just want to get to the bottom of what caused the administrators to take this unusual step,” Caney said. PTA Council past president Candace Banks signed the letter — in addition to the 18 current PTA presidents — and said an independent investigation should occur despite Palmer’s resignation, in order to address the system failure that occurred in the schools. “The overall takeaway was this is a problem and we need to fix it. The fact that we as parents had the survey means the problems were not being adequately addressed,” Banks said.